When our car is acting up, we take it to the mechanic who will ask certain questions and expect certain answers necessary for identifying the problem. The same is true with our doctor; they rely on us to give them the information they need in order to provide us the best care. belief that someone or something is reliable, good, honest, effective, etc. A good doctor-patient relationship depends on a healthy exchange of reliable information and confidence in our doctor abilities. Following are some things we need to consider when building a mutually rewarding relationship. What Should We Expect from Our Doctor? Appropriate credentials, such as board certification in their field of practice. The ability to take a complete history and physical. Use of symptoms and physical finding to formulate a plan of care. The ability to explain things using words we understand. Time to clarify what we hear. Patience that allows us to express our feelings. Willingness to make the appropriate referrals. A holistic approach that includes physical, emotional, and spiritual needs. A non-judgmental demeanor that exudes respect and compassion. Some doctors feel uncomfortable with their communication skills, and sometimes patients do too. But, there are ways we can improve. Respect silence. I understand we fear we will forget to ask an important question, but our doctor may be deep in thought about formulating a plan for something else we just shared. Be a patient, patient. Doctors get distracted too. Maybe a patient just came in that required hospitalization and your doctor is thinking about how he/she will be able to accommodate everyone’s needs. Pay attention to non-verbal clues and be considerate and kind if you need to redirect your doctor back to the topic. Clarify. Make sure your concerns are being heard or that you conveyed your concerns so your doctor understands. Remember, your time with the doctor is limited. Maximize it by making a list and setting priorities. Think of your doctor as a team member. Let him/her know what things have helped, and what things have not. Treat your doctor with the same respect you expect. Let your doctor know you are grateful for their time and attention when they go out of their way to accommodate you, little things can have the greatest impact. Clarify your care plan with your doctor before leaving their office. It will keep the both of you on track. Remember, they see many patients on any given day. Get to know the staff. If the doctor isn’t listening, or is not taking your concerns seriously,GET A NEW ONE! We certainly don’t take our car back to a mechanic we don’t trust. 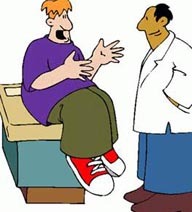 Just like taking our car to a new mechanic, it’s reasonable to have some level of apprehension when we see a new doctor. Our fears and worries are based on our previous experiences and not all of them have been ones we want to repeat. But, just like a good mechanic, we gain confidence in our doctor’s skills when they listen to the information we provide. Troubleshooting is important, if certain things have or have not worked, write them down and give the list to your new doctor. It will save time that can be used to explore new options, and then be open to new options. People are not mind readers. Don’t assume your doctor knows what you expect, let him/her know. We need to know they support us. We all have physical, mental, emotional, and spiritual needs, and just as important as managing illness is the success we feel when our doctor gives us a heartfelt touch, or simply says, I understand. On the other hand, we know they are not miracle workers, and they need to know we don’t expect them to be. Successful treatment is often measured by our expectations, both physician and patient. The foundation of a productive physician-patient relationship requires trust, confidence, communication, gratitude, compassion, and respect. Remember that things take time, but when you find the right doctor, it’s worth it.